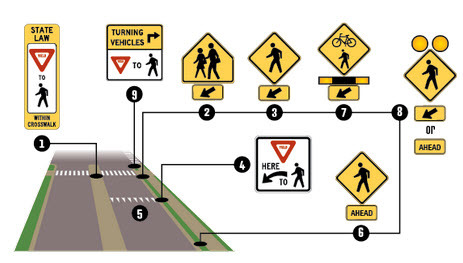 Right-of-Way laws, together with courtesy and common sense, help to promote traffic safety. People driving often come into conflict with other people walking, biking or driving because their intended course of travel intersects – or collides. Signs, signals, markings and other features are used to communicate who has the right-of-way. Many times, these signs are ignored and the person walking or driving believes they can outrun the other, which is when collisions occur. 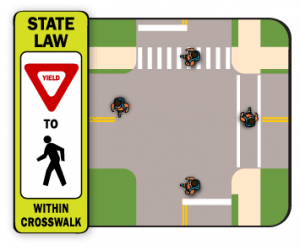 Florida Statute states a vehicle approaching a pedestrian legally crossing the street at an intersection must yield or stop to allow the person walking to cross. This applies to bicyclists as well as motor vehicle drivers. If you fail to yield, drivers face a minimum citation of $164 and three points on their driver’s license. Worse, you can severely injury someone – even taking their life. The WESH 2 news clip is from Operation Best Foot Forward, a crosswalks enforcement action with Orlando Police Department, Orange County Sheriff’s Office, Kissimmee Police Department and Osceola County Sheriff’s Office to remind drivers about Florida’s Driver Yield Law. A pedestrian may not cross between adjacent signalized intersections. Except in a marked crosswalk, a crossing pedestrian must cross at right angles to the edge of the roadway, or by the shortest route to the opposite side. A pedestrian may not cross an intersection diagonally except where and when crossing is authorized by official traffic control devices. Unless otherwise directed by a pedestrian control signal, pedestrians facing a steady red signal shall not enter the roadway. A pedestrian facing a green signal, except when the sole green signal is an arrow signal, may proceed across roadway in any marked or unmarked crosswalk (i.e., in the direction controlled by the signal face) unless directed otherwise by a pedestrian control signal. A pedestrian facing a steady yellow signal indication is thereby advised that there is insufficient time to cross the roadway before a red indication is displayed, and no pedestrian shall then start to cross the roadway. Jaywalking is not a legal term – it is not found in Florida statutes and has no legal meaning. Some actions that people call jaywalking – such as crossing against a red light – are illegal. But crossing mid-block, which is also called jaywalking, is legal in most locations. All sides of the intersection are crosswalks – marked or not, regardless of whether the sidewalk is paved or not. The only exception is where a state or local government has explicitly closed a particular crosswalk, and a sign must be placed at such a crossing to indicate that it is closed. If you are driving along a road and there is a cross-street, you must yield to any pedestrian in an unmarked crosswalk at that intersection. If another vehicle is stopped ahead of you at a crosswalk do not pass that vehicle. There many be a crossing pedestrian hidden behind that first vehicle. If there is no paved sidewalk, that strip of grass in the public right-of-way is still a sidewalk, although it may not be a useable one for pedestrians – tall grass, landscaping, and other challenges could make it difficult to use. The Florida statue only defines who is required to yield the right-of-way. Pedestrians at crosswalks at signalized intersections must yield if they face a red traffic signal or steady DON’T WALK signal. Drivers entering a public street from a private driveway must yield right-of-way to a pedestrian approaching on the sidewalk or roadway, just as one yields to other traffic. Pedestrians cannot enter the crosswalk at any time they wish. Pedestrians must give drivers adequate time and distance to react and stop. If you are already in the crosswalk you can finish crossing. The flashing DON’T WALK phase is timed so that you can make it all the way across the crosswalk at a normal walking pace – provided drivers are not cutting you off by turning across your path. Drivers, if the pedestrian is in the crosswalk and the DON’T WALK sign is flashing, you have to yield. As drivers, you have to be prepared to slow or stop at any time – for emergency vehicles, buses, bicyclists, animals, other motorists slowing to turn, and other situations. Our first priority: Get drivers to yield on lower speed streets and get pedestrians to clearly communicate their intention to cross. Over time, we can work on having the same type of good behaviors on our higher speed roads. Click here for the complete pedestrian-related Florida statutes. Information provided by Mighk Wilson, Smart Growth Planner for MetroPlan Orlando.